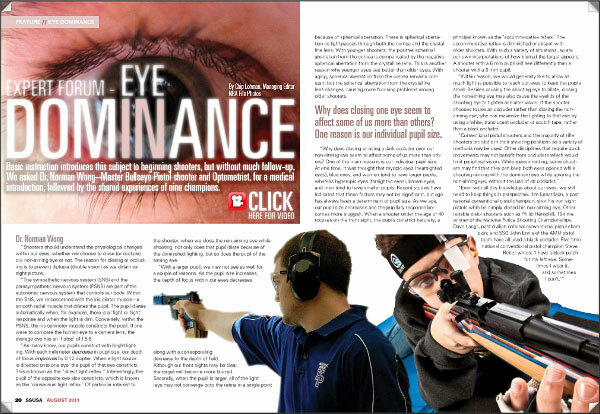 There are many benefits to shooting with both eyes open especially when shooting shotguns and handguns, but training yourself to do it can be challenging for some. For many, it is a struggle to fight the natural instinct to close one eye. So how do you train yourself to kick that habit? The first step is to determine if you can see the sights with both eyes. If you can’t get a clear sight picture on target with both eyes open, or if you see two front sights or some other strange configuration that is nearly impossible to decipher, then shooting with both eyes open may not work for you. It’s not the end of the world. It’s more important that you acquire a proper sight picture and hit your target. If you are a competition shooter that struggles with this you can get a little help from some frosted tape. In most cases it; just a matter of determining your eye dominance and placing a piece of tape on your eye protection on the lens in front of your non-dominant eye. The tape blocks this eye from seeing the sights, but still allows you full access to your peripheral vision. An effective way to prevent yourself from closing an eye is to spend a good amount of time dry firing. (Dry fire means NO AMMO!) Practice acquiring the sights with both eyes open. Start with the firearm at low ready with both eyes on the target. Bring the gun up to your line of sight and acquire the proper sight picture on your target. The repetition of presenting the gun will help train you to keep those eyes open when you transition to live fire. As with any habit, you’ll need to train yourself to stop — this means more than just a few times dry firing. When you hit the shooting range, you may find that despite all that dry-fire practice, you still close an eye. It might be a matter of sympathetic reaction to recoil. Using .22 caliber, airsoft guns and light loads can help you transition to larger calibers and full power ammunition. Just as you had to concentrate keeping both eyes open in dry fire, it’s likely you will have to do the same during your live fire training as well. Share the post "Skill Training: Shooting with Both Eyes Open"
New optical technology from the Idaho National Laboratory could make a big improvement in non-telescopic iron sights. INL’s new “MicroSight” uses a Zone Plate design to focus light so that BOTH front sight-blade AND the target appear in sharp focus. This technology could be a major breakthrough for iron sights shooters, particularly older shooters whose eyes have difficulty focusing at multiple distances. The INL MicroSight’s wafer-thin optical element is only about 1/4″ in diameter, and it has been successfully adapted for match-type rear iris sight systems. Initial tests show the MicroSight can help iron sights users shoot better scores, with less eye fatigue. The technology could aid hunters and soldiers, too, either as a primary aiming device or as a lightweight backup for other types of sights. The human eye has trouble focusing on both a firearm’s front sight blade and the much more distant target at the same time. 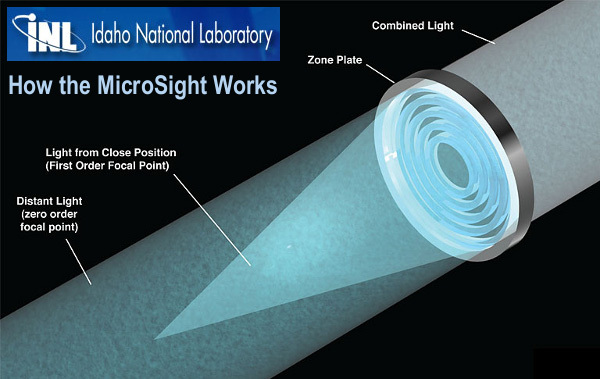 Idaho National Laboratory’s innovative gunsight technology, the MicroSight, helps the eye solve this problem. The MicroSight, a disc smaller than a dime, brings both the target and the iron sight into simultaneous focus, giving marksmen a better sight picture. The new sight has national-security applications, as it could improve safety and performance for American soldiers. 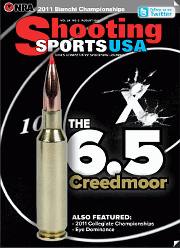 Millions of target shooters and hunters should also benefit. “The MicroSight gives you much of the performance you’d get out of a holographic or telescopic sight,” says INL engineer David Crandall, who developed the technology. “But it’s more reliable, much lighter-weight and much cheaper.” The alternating rings on zone plates bring faraway and nearby objects into focus simultaneously. Crandall is not an optics specialist. Most of his past work tended toward infrastructure engineering, like nuclear projects with INL’s Advanced Test Reactor. But Crandall is a highly accomplished target shooter — he’s a member of the U.S. national long-range rifle team — and he’s come up with several other shooting-related inventions. He patented a rifle-stabilizing shooting sling, and a small, powerful breaching shotgun that could help law-enforcement personnel storm buildings more effectively. One day, Crandall was leafing through an optics textbook, and he stumbled across a section on “zone plates.” Zone plates are optical devices that resemble lenses. But whereas lenses focus light using refraction — essentially, changing the direction of light waves by changing their speed — zone plates use diffraction. Diffraction describes how waves bend, break up, spread out and interfere with each other as they encounter obstacles. The diffraction of sound waves, for example, explains how you can hear someone’s voice from around a corner. Zone plates focus light via a set of concentric rings that alternate between transparent and opaque. The transparent sections let some light waves pass through unchanged, focusing objects that are far away (basically, at infinity). But light passing the edges of the opaque rings gets diffracted, which brings nearby objects into focus. The seemingly impossible result: sharp images of distant and near objects, simultaneously. Crandall took his idea to INL’s technology transfer division, which also saw the promise and agreed to fund his research. He eventually found his way to phased zone plates. 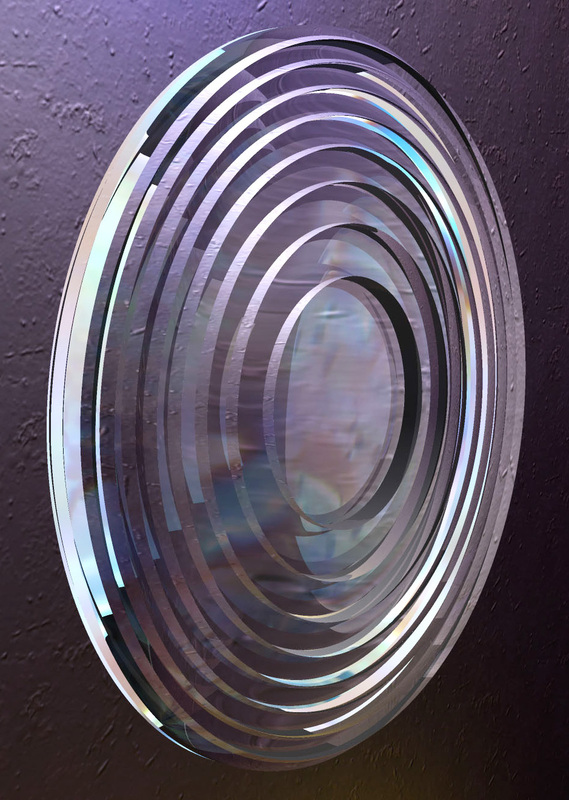 Phased zone plates replace the opaque rings with transparent glass of varying thickness. This accomplishes the same goal — diffraction — but does so without losing as much light, yielding brighter images. After much tinkering, Crandall came up with the MicroSight. 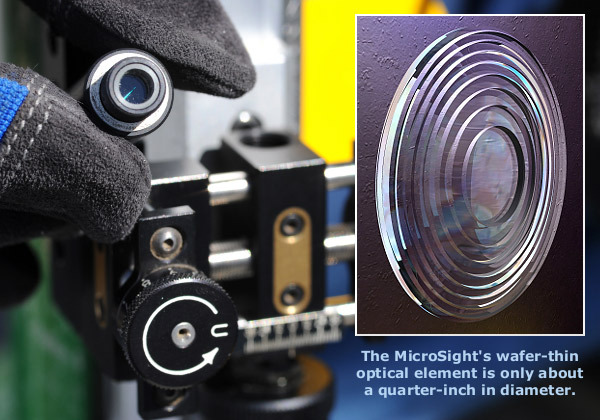 CLICK HERE for giant-sized photo of MicroSight element. Without help from zone plates, the human eye cannot focus on two different planes at the same time. So shooters using only standard-issue iron sights see either a blurry target or a blurry sight. The MicroSight isn’t the only gunsight technology that can overcome this problem, of course. Telescopic sights magnify targets, bringing them into close, crisp focus. And holographic sights project a red dot onto an image of the target, showing clearly where the shot will land. But telescopic and holographic sights have their drawbacks. For one thing, they tend to be bulky. Both types of sight can add one or two pounds to the weight of a rifle — not a trivial concern for hunters or soldiers who must lug their weapons for miles over rough terrain. Further, both are complex instruments with fragile components. They can break, especially if dropped or banged against a rock or tree. Red-dot sights require batteries, which can die. And neither one is cheap: most red-dot sights cost more than $100, and high-quality telescopic ones can run $1,000 or more. The MicroSight, on the other hand, is tiny — its zone plate is thin and only about 1/4″ in diameter — and relatively cheap. Crandall says the sight should cost significantly less than red-dot and telescopic sights when Apollo Optical Systems, which licensed the technology, takes it to market. The company is currently working with gunsight manufacturers to design and develop various MicroSight versions. In the future, some of these versions might add refractive power to the zone plate, achieving some level of target magnification. Crandall foresees other possible applications as well, such as in handguns and night-vision goggles. In any situation that requires taking the long and the short view at the same time, this new INL technology could provide a major advantage. Article and graphics courtesy Idaho National Laboratory (INL), www.inl.gov. 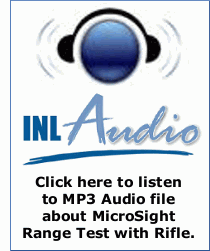 Share the post "Breakthrough MicroSight Technology Improves Iron Sights"